Another meal with the hui's. I decided on Jamie's Spanish Roast Chicken and as I type remember that I have chorizo left over. Can you say breakfast burrito for dinner? After a lot of talk about how to best roast this young organic chicken, I decided on this recipe because it didn't require basting. The chorizo and it's fat would do that for me, and the potatoes would then have a wonderful flavor and the chicken would be moist thanks to the lemons which were boiled quickly in water with the potatoes. Yum. I failed to take a picure of the final product. Here's another lesson in imagination. Spanish roasted chicken, garden salad, patio, warm summers night, chiminea, molly, Dover's Cujo wine. You get the picture. Summer- don't go away. 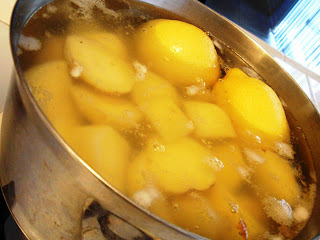 First preheat you oven to 425ºF then place your potatoes with 2 of your lemons into a small pan of water and boil for 5 minutes. Drain, and then prick the lemons all over with a knife. (The reason for doing this is that you are going to put them inside the chicken and their wonderful juices will be released while cooking. They will burst with flavour and fragrance, and the heat from the lemons will help the chicken to cook quicker from the inside as well as making it taste and smell amazing.) 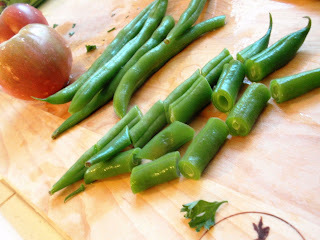 Remove the parsley leaves from the stalks and put to one side. 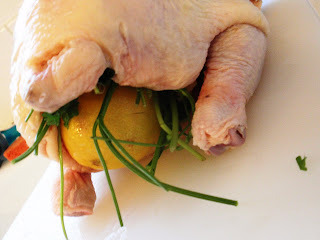 Stuff the chicken with your hot lemons and the parsley stalks. Then season the chicken and the potatoes with a little salt and freshly ground black pepper, and slice your chorizo at an angle, /¼ inch thick. Get yourself an appropriately sized baking tray. Take a piece of greaseproof (wax) paper and wet it under a tap so it becomes flexible, then shake it out and lay it into the baking tray. Place the potatoes into the centre of the greaseproof paper, then place the chicken on top and sprinkle with the chorizo and a little of your chopped parsley. Drizzle with a little olive oil. Cook in the preheated oven for around 1 hour 20 minutes. Now make a gremolata, by finely chopping the zest of your 2 remaining lemons and mixing it with the chopped parsley and garlic. Season lightly and toss together to create a really fragrant seasoning-type garnish. This really makes the chicken- don't forget it! Remove the tray from the oven, take the chicken out and put to one side to rest. 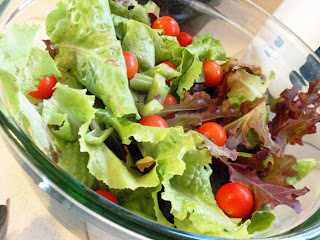 Carve up and enjoy with a nice summer salad. Roasting a chicken is easier than you might think. Try it! um is that how the greeks make those awesome awesome lemony potatoes? throw a couple lemons in the boiling water? never knew hall, never knew. Pretty glad I'm not that chicken right about now. Ouch.